If there is already a consensus on man-made climate change and the science is settled, then shouldn’t spending far more directly go into existing solutions instead of continuing to study the problem and potential future solutions. 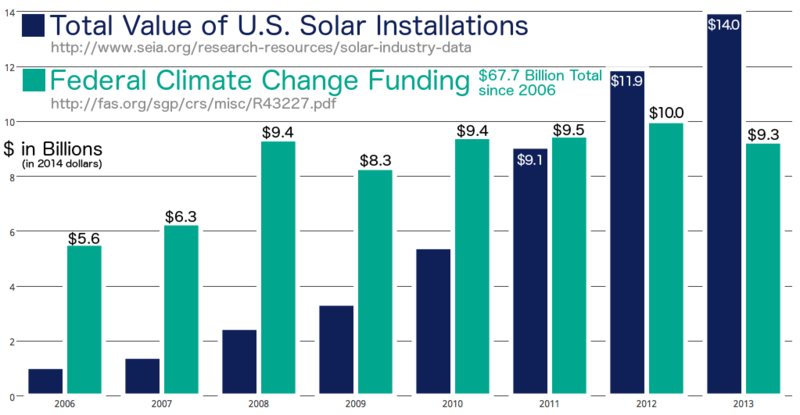 What if ALL Federal Climate Change Funding had gone directly into purchasing solar technologies? 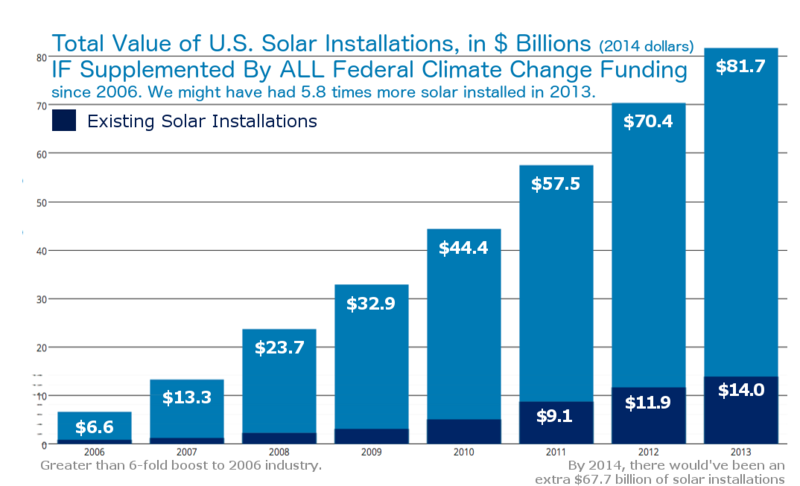 What if this money was converted directly into U.S. solar installations instead of funding research, analysis, subsidies, energy efficiency, or financing. In this hypothetical, the U.S. government would spend more like a straight-forward participant in the market, which for many on the right might be a more preferable role. It could start with its own infrastructure’s energy needs (which are actually tied to budgets far beyond just climate issues). The government could easily be the largest customer, dramatically increasing demand and single-handedly boosting the solar industry’s position in the U.S. and global markets. Solar energy has wide public support, even though climate change theory has been one renewable source of passionate divide between the left and right, helping maintain mutual status as enemies. Below are budget totals for “Federal Climate Change Funding” from the Congressional Research Service (in teal), next to the yearly total values of U.S. solar installations (in dark blue, SEIA data from above). This could be interpreted as government already having collected $132 billion in taxes devoted to the greenhouse gas alarm since 1993, without a carbon tax or cap-and-trade scheme. The Federal Climate Change Funds from 1993 through 1996 alone total $17.7 billion (in 2014 dollars). 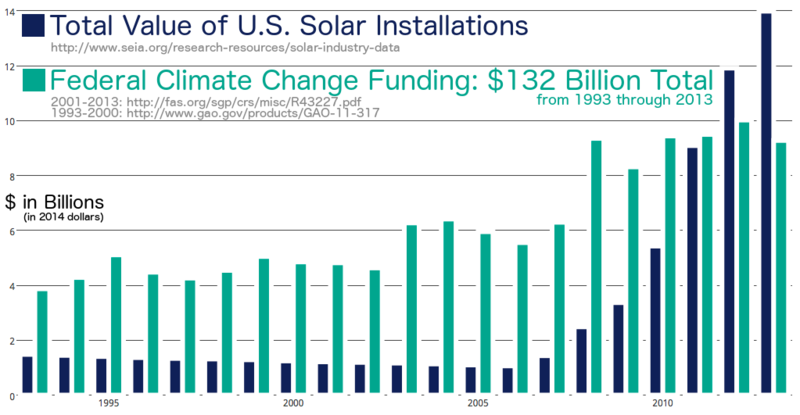 So nearly 25% could be lost in bureaucracy, and we still could have accomplished our 2013 solar industry capacity by 1997, sliding the solar hockey stick 16 years earlier. I also argue that the IPCC budgets would also be better used on directly purchasing solar, but that body amounts to much less than 1% of this federal funding (which does support a significant part of the scientific research the IPCC relies upon). This is why I have left the IPCC budget out of the above calculations, about $175 million since 1988 (2014 dollars). Another huge scenario would be to look at the government subsidies for the different energy industries and redirect them to renewables only. Again I would prefer if the government just directly purchased and implemented renewable technologies, boosting their market share and lowering the price through more natural economic causality instead of providing subsidies. Maintaining access to low prices from oil reserves in the Persian Gulf is one of the single largest overt reasons for military expansion and presence in the Middle East. This simply MUST be factored as an externalized cost of “cheap” oil. Spending big money to directly purchase solar technologies would increase our energy independence without the completely predictable blowback caused by [coalition] invasions, occupations, and covert operations lacking democratic oversight. I argue this would not be a foreign relations compromise, but in fact a more advantageous long-term strategy in the War of Terror. It is more powerful to use sources of energy which are not dependent on geography. 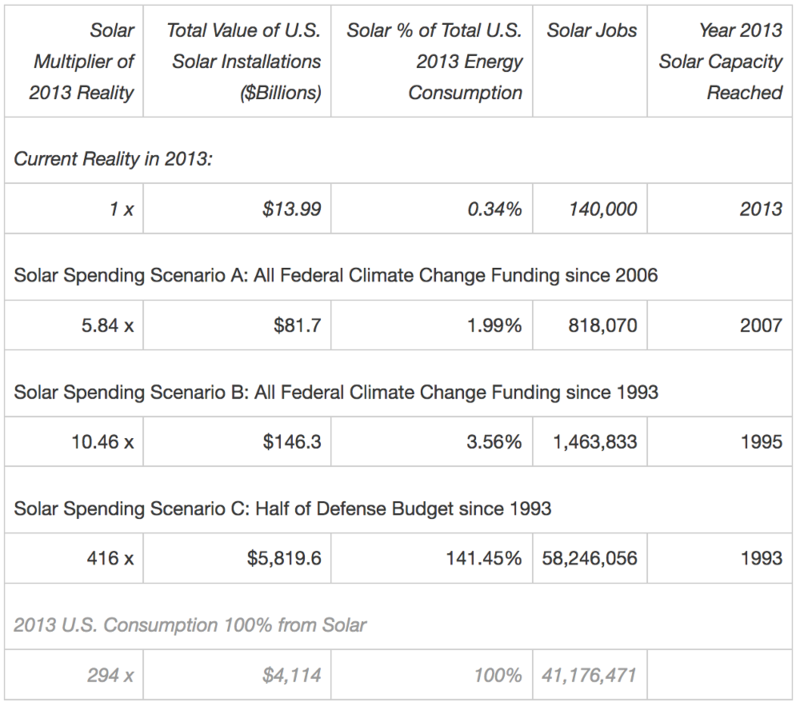 My final hypothetical scenario considers if half of our defense budget since 1993 had gone directly to purchase solar technologies, much more dramatically skyrocketing the solar industry’s position in the market. 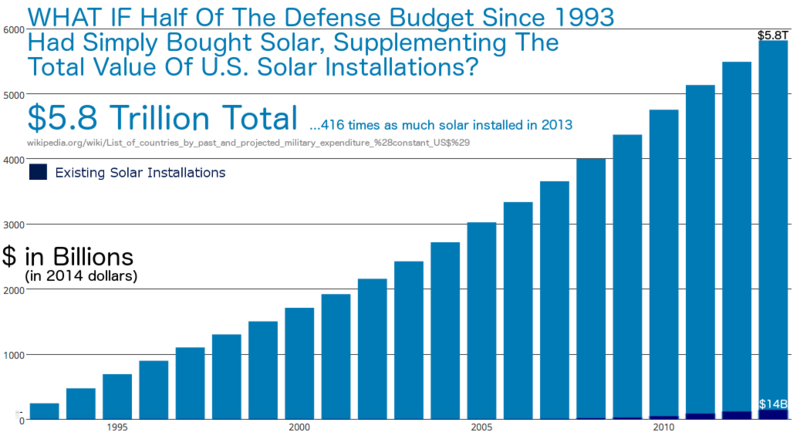 Even if large chunks of the defense budget were just spent on solar for the military itself (without changing the size of the defense budget), this would still have profound impacts on the demand on (and size of) the solar industry. It would also be more strategically effective in the War of Terror — and even world peace, literally — than buying more guns, ammo, sanctions, air strikes, invasions, military bases abroad, homeland security, intelligence drag-nets, secret torture prisons, private armies, proxy-wars, instigated revolutions, coups or other covert meddling… combined. Energy Independence IS Homeland Security. *I have no knowledge of, nor affiliation, nor conflict of interest with this manufacturer, nor any other. 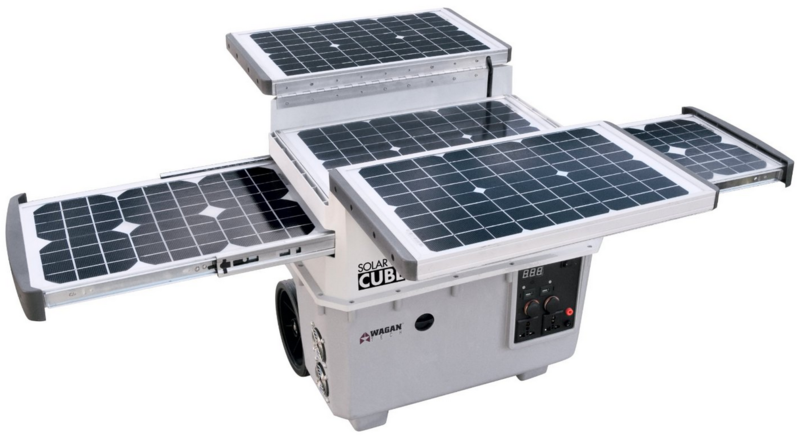 Beyond independently satisfying ALL of our own energy needs, we could air drop things like portable solar cubes all over Africa, the Middle East, and other places without first world problems. Places where even access to basic lighting at night makes a huge difference. I bet we could get a better bulk deal that might balance the shipping costs, but the $327 billion half of the 2013 defense budget could have directly Amazon Primed 327 million solar cubes generating 80 Watts each. Larger aid drones might have dropped these 26 GW of solar power instead of predators dropping bombs. Collateral empowerment only. And of course, if we had been spending on big solar for twenty years, the price of photovoltaics would already be dramatically lower and the total hypothetical solar wattage dropped would be dramatically larger. United States overall energy consumption grew to 97.3 quadrillion Btu in 2013. Domestic energy production was at 81.8 quadrillion Btu, with only 0.4% generated by solar. So I estimate our 2013 solar energy production represented roughly 0.34% of our overall consumption… weak. 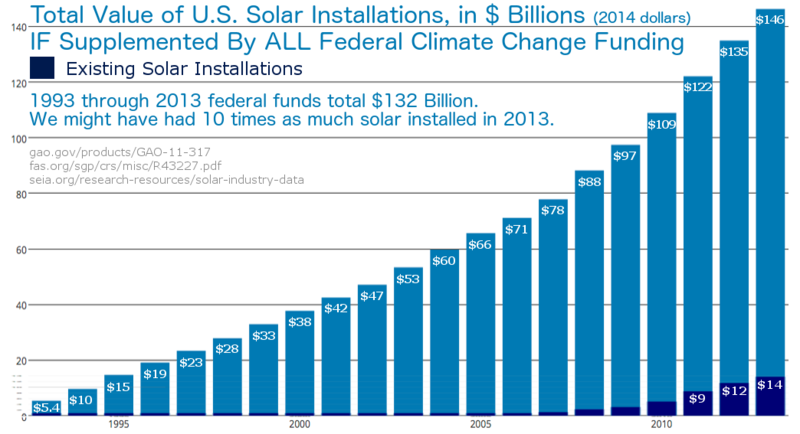 And the SEIA chart at the top (Chart 1) estimates over 140,000 solar jobs in 2013.